Oh boy is the rumor mill buzzing tonight! 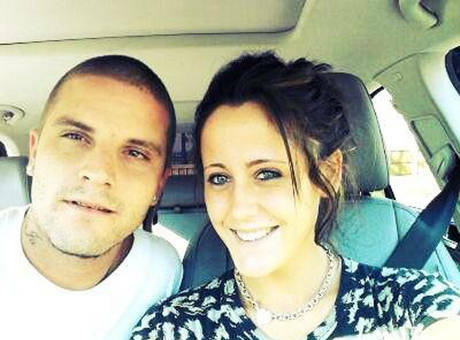 Teen Mom 2 star Jenelle Evans married boyfriend of ten minutes – err two months, Courtland Rogers, earlier today and a few people close to the train wreck say that this is most definitely a shotgun wedding because Jenelle is pregnant. First Jenelle’s estranged older sister Ashleigh referenced the possibility of the wedding being shotgun style earlier today and Jenelle didn’t deny the marriage but insisted that it would be horrible to have another baby before retaining custody of her son, Jace who lives with Jenelle’s mother, Barbara Evans. Do you think Gary actually has inside information and Jenelle is just trying to buy herself a little time before it’s really obvious that she is pregnant? I mean, why the hell would this chick marry anyone unless she felt forced – or was so high that she still doesn’t really know vows were swapped? If by chance Jenelle isn’t knocked up, then how long do you think these two will be married? Weeks? A few months? Let’s hope that another baby is not on the horizon for Jenelle because we already know that she is incapable of being even a halfway decent mother and Barbara is certainly not going to raise two of Jenelle’s kids! Best case scenario these two got married while in a drug haze and now they are married with an uphill battle right off the bat. Courtland’s got some custody problems of his own so they aren’t fighting for one kid, but two already. They don’t need to add a newborn to that mix! Do you think Jenelle is pregnant and in two months she’ll announce a pregnancy and fudge her due date so it looks like she was married first? Tell us your thoughts in the comments below!